Leroy Stutz was born in 1939 in Effingham, Kansas. He enlisted in the Kansas Army National Guard in January 1957 and entered the U.S. Air Force Academy in June 1960. He was commissioned in the Air Force on June 3, 1964, and completed pilot training in August 1965. Stutz flew the RF-4C Phantom II reconnaissance aircraft, first at Shaw AFB, South Carolina, and then from Udorn Royal Thai Air Base, Thailand. Col Stutz flew 85 combat missions before being forced to eject over North Vietnam on December 2, 1966. After spending 2,284 days in captivity, he was released during Operation Homecoming on March 4, 1973. Stutz next served at the U.S. Air Force Academy before going to the Air Command and Staff College. In May 1978, he attended Maintenance Officer School at Chanute AFB, Illinois, and was assigned to MacDill AFB, Florida in September 1978. He served as officer in charge of the 61st Aircraft Maintenance Unit, maintenance supervisor, and later as commander of the 56th Aircraft Generation Squadron and assistant deputy commander for maintenance. After completing Air War College in May 1985, he returned to MacDill AFB and became the deputy commander for maintenance for the 56th Tactical Training Wing. Col Stutz was next assigned as the deputy commander for maintenance of the 552nd Airborne Warning and Control Wing at Tinker AFB, Oklahoma, in December 1987. 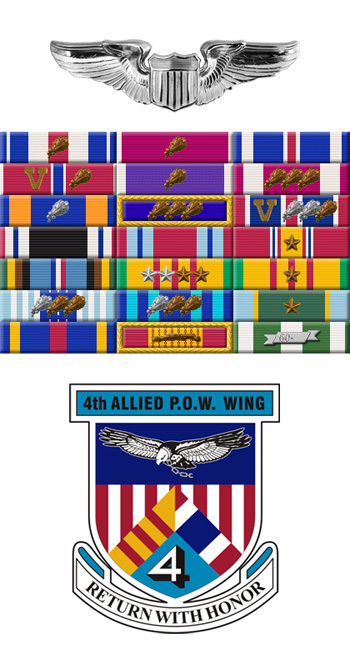 Next he went to Chanute AFB, Illinois where he became the vice wing commander and the chief of the operation division of the 3330th Technical Training Wing in July 1990, the commander of the 3360th Technical Training Group in February 1992, and the commander of the Training Wing in November 1992. 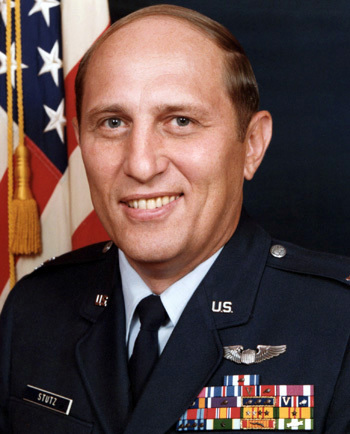 Col Stutz retired from the Air Force on June 30, 1994. He was rated a pilot with over 750 flying hours in the T-37 Tweet, T-33, and RF-4C Phantom II. He is married to the former Karen Keirns of Cummings, Kansas, and they have one son, Brian, and three grandchildren; Aaron, Austin, and Aimee. First Lieutenant Leroy W. Stutz distinguished himself by gallantry in connection with military operations against an opposing armed force near Hanoi, North Vietnam on 23 November 1966. On that date, Lieutenant Stutz, despite extremely hazardous conditions, reconnoitered the Dap Cau Railroad and Highway Bridge near Hanoi. This night, low level mission imposed great demands upon the resources and capabilities of the pilot. Exposing himself for fifty-five minutes over hostile territory in a highly sophisticated and lethal anti-aircraft defense structure, Lieutenant Stutz displayed outstanding determination in successfully obtaining the required intelligence on their assigned target. This intelligence was instrumental in restricting the flow of vital materials transported on the railroad leading from Hanoi to Communist China. By his gallantry and devotion to duty, Lieutenant Stutz has reflected great credit upon himself and the United States Air Force.